Posted on Mon, Nov 28, 2011 : 2:59 p.m.
Mariel and her puppy, Pickles, who preceded her in death. Photo courtesy of Leisa Thompson. It was a short conversation, but the chatty 8-year-old with the radiant smile captured his heart last summer in a way that he'll never forget. 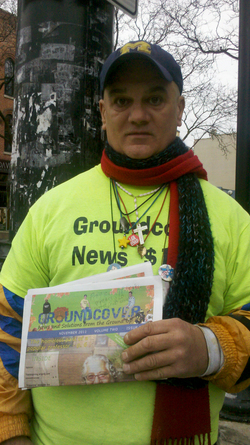 From that day in late August, the Groundcover newspaper vendor who goes by Tony S. has written "Pray for Mariel" on every paper he sells, typically from the corner of Liberty and Main streets. Mariel Almendras was downtown that day with members of the Michigan Ovarian Cancer Alliance, tying teal ribbons around town to promote cancer awareness. She stopped to talk with Tony, and shared her story of suffering from a rare form of ovarian cancer. "She just shined, she was so special," Tony said, after learning Mariel passed away on Thanksgiving. "She was the inspiration that kept me going because I wanted to keep putting out the paper with her name on it. She's part of my corner now." That's how Mariel Almendras lived her short life — making new friends everywhere she went, no matter how young or old. Touching people's lives in a way they didn't soon forget. I'm among those who called Mariel a friend. For two years, I was her "Daisy mom," as she participated in the Girl Scouts troop I led at Dicken Elementary School. I feel fortunate to have been on the receiving end of those smiles, those hugs and that endless chatter. Her family, our school community and countless others are now in mourning for Mariel, who died of complications related to the cancer. But despite the sadness, there is much to be celebrated about a life lived with such passion and faith, a life that brought so many others together. Mariel was born in Cebu City in the Philippines, the daughter of Sean and Emmeline, or Gemma, both physicians. 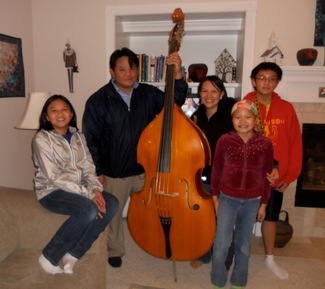 When Mariel was two, Sean, who was born in the United States, was offered the opportunity to emigrate with his family to the U.S. Envisioning more opportunities for Mariel and her older siblings — sister, Ella, and brother, Gean — Sean and Gemma made the move. Neither practices medicine currently. Sean works for the Medical Center Information Technology team at the University of Michigan Health System. Gemma, who worked as a lunch supervisor at Dicken for a couple of years, has made several starts at studying for the medical boards. But her priority has been caring for Mariel and her siblings. In August 2009, Mariel was first found to have a rare Sertoli-Leydig cell tumor the size of a small cantaloupe on one of her ovaries. Doctors at C.S. Mott Children's Hospital removed the tumor that month, and she received several rounds of chemotherapy. In January she returned to school, and remained in remission for all of 2010. My colleague wrote a story about Mariel delivering holiday cards and gifts to children at Mott that December. But in February 2011, the tumors came back, and this time they were more aggressive. Mariel spent March through May undergoing chemotherapy, then went to MD Anderson Cancer Center in Texas for surgery and hyperthermic intraperitoneal chemotherapy. "Her surgeon gave us a very good prognosis, even talked about us sending her graduation or wedding pictures someday," Gemma said as she, Sean and I talked at a local coffeeshop on Saturday. "We thought it was God's answer to all our prayers, and we were making plans for her future once again." The family spent most of July and August as a family should: going swimming, visiting Cedar Pointe, and spending time with friends. After Labor Day, Mariel attended the first day of school and came home exhausted. That night she woke with unbearable abdominal pain, and was admitted to the ICU at Mott. The tumor had returned, and she was bleeding internally. Her doctors said she might not make it, and calls for prayer went out. A day later, the bleeding stopped, and she was able to leave the ICU. Her body wasn’t stable enough for surgery, so she was to undergo radiation treatments to control the mass. If and when the tumor shrunk, the plan was to take her back to Texas for surgery. That opportunity never came, because despite the radiation, the tumors continued to grow and multiply. She spent October and November in and out of the hospital, before being admitted for the final time the night before Thanksgiving. A scan that night revealed that the tumors had taken over most of her vital organs. Throughout the roller coaster of the past two years, the Almendras family has found strength and inspiration in their Catholic faith — Mariel as much as anyone. But in those last few weeks, Gemma saw Mariel’s faith shaken for the first time, as she questioned the unfairness of it all. Gemma said her faith remains strong, but she wants to know why all the prayers didn’t lead to healing. When Mariel’s cancer returned, her aunt, Portia Almendras, set up a website called Mariel's Angels to update the community on her progress and organize those who wanted to help. Tony S. shows a newspaper Monday with a new message: "Pray for Mariel, 8 years old. With God now." The supply of help was greater than the demand, so people improvised. One mother from school raised $750 to buy Mariel an iPad. But before she could purchase the device, another mother gave Mariel the iPad she had won in a school raffle. The iPad became Mariel’s key to the outside world, and the money went to the family to help defray expenses. Before Mariel’s surgery in Texas, people from her various support communities — including MCIT, Dicken and Slauson schools, Mott, and St. Francis of Assisi church — came together at Dicken for a fund-raiser. Mariel, who was in Texas for pre-op tests, was Skyped into the event on a big screen. Throughout the winter and spring of 2011, her second-grade teacher, Cathy Cieglo, visited her several times a week, helping with lessons, teaching her to quilt, and just talking about life. Many in the Dicken community won’t soon forget the image of Cieglo on the last day of school, holding her laptop high like John Cusack in the movie “Say Anything,” so Mariel and Gemma could watch via Skype as older sister Ella was “clapped out” along with the rest of the fifth-graders. Sometimes the help came from surprising corners. A neighbor who they didn't know very well showed up one day and started mowing their lawn. He did it every week after that, and raked the leaves, too. This fall, another neighbor granted Mariel’s wish to get a puppy. Mariel named him Pickles, and the neighbor, who took care of the little schnoodle for the family, would bring him to visit her in the hospital. But a few weeks later, Pickles had a freak accident, and died soon after undergoing brain surgery. No one told Mariel — until the very end. As she was dying, Sean told her to look for Pickles in Heaven. On a class field trip, the animals flocked to Mariel. From the time I met her — a year before she first got sick — it was clear Mariel had confidence, maturity and faith well beyond her years. Other parents have echoed that sentiment in recent days. How else do you describe a child who sings in the school talent show despite having lost her hair from chemotherapy? Who knows more adults in the neighborhood than her parents, because she chats with everyone she passes by? Who routinely corrects and encourages her older siblings? Who leads the family in prayer? Who consoles her father, even as she is suffering? The stories of Mariel’s faith and generosity, posted on the “Angels” website, set off prayer chains that reached far beyond Ann Arbor. Gemma said they have received messages from people across the United States and as far as Israel and Australia, from people of many different faiths, who heard about Mariel and were inspired to pray for her. For some, it was the first time they had prayed in years. As we neared the end of our conversation, a woman who had been sitting at a nearby table walked over. Visitations will be held at Nie Funeral Home, 3767 W. Liberty Road in Ann Arbor, at the following times: Dec. 1, from 2 to 9 p.m., and Dec. 2 from 2 to 9 p.m., with a scripture service at 6 p.m. After the service, people will have the opportunity to say something about Mariel. There will also be a visitation Dec. 3 at noon at St. Francis of Assissi church, 2250 East Stadium Blvd. in Ann Arbor, preceding the 1 p.m. funeral at the church. Update June 17, 2013: A fund in Mariel's name has been discontinued. The family encourages those who wish to support ovarian cancer research to consider donating to MIOCA.org. Jen Eyer is director of audience engagement for AnnArbor.com. Reach her at jeneyer@annarbor.com or 734.623.2577. Sun, Dec 4, 2011 : 12:07 a.m.
Fri, Dec 2, 2011 : 12:45 a.m. I am looking forward to the day this disease is a distant memory. I lost my sister when she was 34 and was devastated. I cannot imagine losing someone at such a young and tender age. My heart aches for her family. She sounds like she had a wonderful, wise and joyful soul. Thu, Dec 1, 2011 : 12:39 a.m.
Mariel Almendras was my best friend, I loved doing everything with her talking, biking, and playing outdoors. When you needed her she was there, no matter what. I proud to have known her and be so close to her over the years. She was the one to talk to, she was very honest and kind. I loved her so much, and shes still with us in our hearts forever. She will never be forgotten. Fri, Dec 2, 2011 : 11:06 a.m. 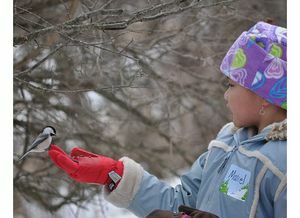 Wed, Nov 30, 2011 : 5:57 a.m.
What a brave little girl. Ovarian cancer is seldom heard of in someone who is so young. Condolences to her family. Angela Todd, Ann Arbor resident. Wed, Nov 30, 2011 : 1:46 a.m. The sweetest girl who had many things to talk about, never ending stories. So happy that she came into my life. I am honored to be one of her friends. I will never forget the time when we performed to the song of Party In the USA. Very talented, funny, and smart. You will always be remembered. That sweet smile, contagious laugh, and joyful face will be tattooed in my mind forever. We were your angels here, now you're our angel. Tue, Nov 29, 2011 : 9:10 p.m.
Mariel was and still is my best friend. She was so positive. I loved biking and even angering the boys down the street with her. She never held back. She was one I could talk to, and there aren't many others. When we submitted the dog to the hospital, I wanted to make him all better and bring him straight back to the U of M. Her death broke my heart. She's a girl you could never forget. IMPERSONAL GOD AND PERSONAL EXPERIENCE OF GOD : For people who believe and trust in God, this story hits them like a ton of bricks. It is very difficult to explain or rationally understand as to why God is impersonal in His attitude and remains as a neutral spectator while He is all-knowing. Why is that He is not able to hear the prayer? Indian tradition has examined the pain and suffering that is implicit in human existence and has formulated the view that God is impersonal. He is the original source of all senses and yet He is without senses. He is the Ultimate Truth and He lies beyond Cause and Effect. The Sanskrit word used to explain God's behavior is &quot;UDASIN&quot; which means unattached or detached which may explain His lack of involvement. Having reflected upon God's nature, Indian tradition still directs people to know God as a Personal Creator. God is the origin and source of man's corporeal substance and hence has a personal relationship with each human being who truly exists as Individual with Individuality. This story reveals the nature of the Individual and her Individuality as a created being. It appears that God did not show compassion to her pain and suffering, but God has given me that sense of compassion to experience and react to the pain and suffering she went through. My experience of God is personal as without God I would not have known or understand the nature of pain when it is present and is revealed in life. So, I have to still thank the impersonal God for giving me the ability to shed tears when I know the painful experience this story reveals. Tue, Nov 29, 2011 : 3:28 a.m. I never had the honor to meet Mariel or her family, but this story brought me to tears. What a little angel brought to Earth, perhaps to teach us of the simple yet most important joys in life. You will all be in my thougts. She had what I call the Gilda Radner disease. Hers was just as stubborn to go away as hers was. Her husband Gene Wilder never remarried after her death. Or so I was told. Ovarian cancer is very fast and very stubborn. For some reason this type of cancer is hard to beat. Good luck to the family. I cried when Gilda lost her battle and yes, to all who loose this battle. Tue, Nov 29, 2011 : 2:53 a.m.
Tue, Nov 29, 2011 : 2:35 a.m.
Tue, Nov 29, 2011 : 12:59 a.m.
Mon, Nov 28, 2011 : 11:44 p.m.
Mon, Nov 28, 2011 : 10:40 p.m.
Having 6 kids of my own, I can never imagine the loss of your child. I am so sorry for your family and hope that you will be able to remember her smile and infectious personality that seemed to captivate everyone. My family's prayers are with your family right now. Be strong. Mon, Nov 28, 2011 : 10:22 p.m.
Sincere condolences to Mariel's family, our prayers are with you. Mon, Nov 28, 2011 : 9:46 p.m. Thank you, Jen, for the story. Nicely done. Tue, Nov 29, 2011 : 2:55 a.m. Yes, for all of our complaining This was a well done story. Mon, Nov 28, 2011 : 9:37 p.m.
My sincerest condolences to the Almendras Family - your daughter will live on in our hearts. God Bless this Beautiful Angel and her family! Mon, Nov 28, 2011 : 9:06 p.m.
Our sincere condolences to Mariel's family, and others who knew her. It is inspirational to read about her. Thank you for the story. Mon, Nov 28, 2011 : 9:04 p.m. There is nothing more heart-breaking than the death of a young child. My heart goes out to the family and friends of this little angel. Mon, Nov 28, 2011 : 8:56 p.m. Seeing that sweet angel holding her puppy 'Pickles' with a big smile on her face was enough to make me start crying at my desk. What a strong spirit it must take to have been in her shoes and to still be able to put forth such a beautiful, happy, sincere smile. Tue, Nov 29, 2011 : 3:15 a.m. I had to reread that one on Pickles preceding her in death. I thought the dog went with her. Then I realized I read it wrong. Mon, Nov 28, 2011 : 8:55 p.m.
Wow...the picture of her with the bird is amazing- and seems to be a perfect example of this childs impact on her world. While it seems trite in a way, heaven has received another angel. Shine On, sweet little one. Shine on. I am so very, very sorry to hear of the loss of this beautiful person, whose life touched so many others. I will be praying for her family and friends and for the school community. Thanks, Jen, for sharing this story. I know you must be grieving as well.